While Murder Mystery Machine may be an enjoyable detective game for those who like short, unpredictable experiences, there's no lack of demand for a more structured approach to crime noir stories. 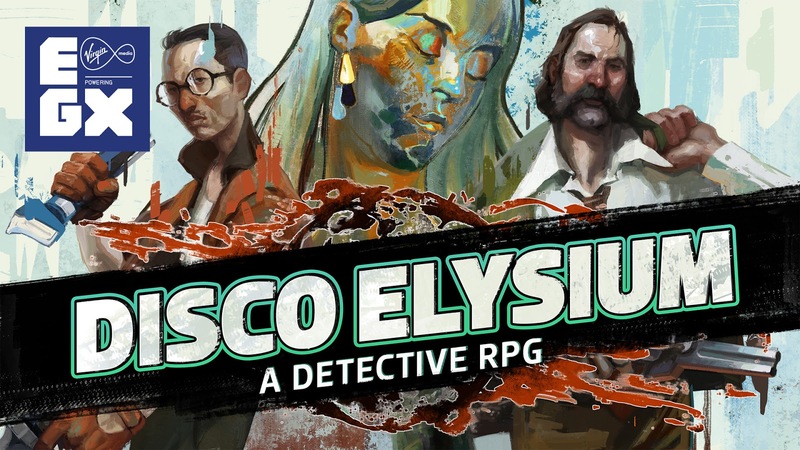 There were several types of these games on show at EGX this year, but the one that I think grabbed most people's attention was ZA/UM Studio's hardboiled cop RPG Disco Elysium. Set in a unique urban fantasy world, the game follows an open-ended homicide case in the corrupt shore town of Revachol West. The protagonist is a washed-up detective that is thrown into this case, and can approach it in many different ways. 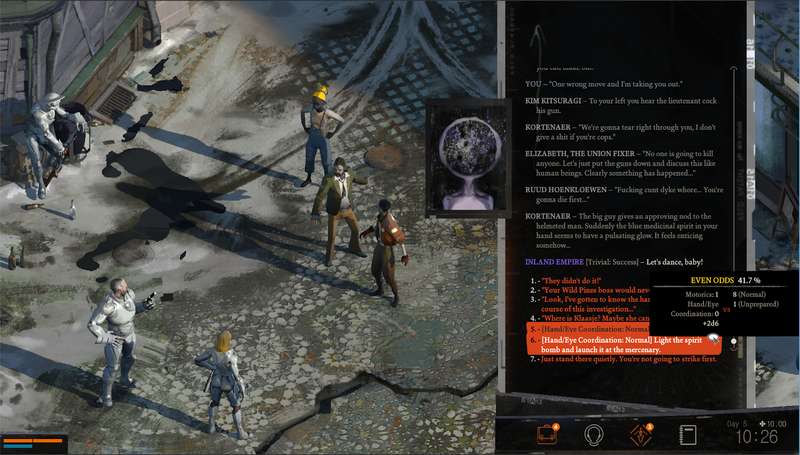 There are skill sets, a social clothing system and a heavy emphasis on dialogue that will all affect how the player progresses through Disco Elysium. I began the session in the protagonist's dismantled motel room. After putting on my clothes, I went outside and starting chatting to a strange woman hanging out in the foyer. Apparently I have amnesia, according to the conversation I had with this woman. Either that or I was still drunk. I even tried hitting on her - as the dialogue tree had hinted for me to do - but I failed a speech check and my words came out awkward and jumbled. After going downstairs into the bar area, I met with a man named Kitsuragi who informed me of a nearby crime scene I had to attend. After stepping outside, I soon ignored my main quest marker as I wanted to explore Revachol. The setting feels somewhat similar to the Dickensian, monolithic shores of Dunwall from Dishonored, with the tone and character art also matching that series. From my 45 minute session, I noticed there was a lot to divulge from this world. There were noticeable tensions between local labourers and the law enforcement, a hint at the game's theme of police corruption. The hidden secrets the city had to offer was plentiful, and I totally forgot about my main objective for the better part of fifteen minutes. I had a talk with two of Disco Elysium's writers - Argo Tuulik and Helen Hindpere - where we discussed what exactly ZA/UM's intentions were with the game's narrative. Olly Writes: I'm really keen on knowing where the influences for Disco Elysium came from. It's billed as a detective RPG but there's also a lot of urban fantasy elements and a big focus on dialogue, where did that all originate? Helen Hindpere: We are all big fans of old RPGs. HH: Yeah, like Planescape Torment. AT: The first two Fallout games. The Baldur's Gate series. HH: Yeah, and we actually all began as friends playing pen-and-paper RPGs. I guess in the beginning this world also had elves and dwarves. AT: In the beginning it was second edition D&D. AT: At some point we got tired of magic and swords and we started chipping it away. We all read a lot of Russian literature too, and a lot of Sherlock Holmes stories too. Things like that was factored in. HH: TV shows like True Detective or Twin Peaks. AT: The Shield, even. That was a major factor to me. Those are the main influences. I could also name a couple of Estonian bands and rock music that have also influenced us. But then also disco music, I guess. OW: So despite it being an isometric RPG, it's less about the combat and more about the wits and intuition featured in dialogue isn't it? AT: There actually is combat but we wanted to take the more realistic approach to police work. Real police officers don't go around killing people. HH: Except in the United States. AT: (laughs) Yes, except the US. HH: But in every other part of the world and in Estonia, they don't go around killing people. AT: Well there was that one time recently... okay, they do go around killing people but this sort of confrontation happens very rarely and can be avoided. So we do have combat but it's played out through the dialogue engine and also in a sort-of D&D way where you have options based on the skills you choose and also based on previous decisions you've made. HH: It also gives it psychological depth, I think. It's actually a really adrenaline-heavy situation to be in. Aiming at someone with your gun. We don't take those situations lightly. OW: So theoretically you could go through the whole game without killing someone? HH: You're definitely going to get yourself into situations but how you respond to them is up to you. AT: There is a way of passing the game without killing a single person or firing a shot. OW: When you were talking about the police killing people earlier, and something I'd noticed while playing, but there are a lot of political statements in this game about law enforcement. Is the story going to go heavily into these themes of corruption, brutality, that sort of thing? HH: We are definitely exploring it. This world we're setting it in. It's a very political world. You basically discover yourself in this working class neighbourhood where people usually have quite negative experiences with the police force. They already have some kind of attitude towards them and it's up to you if you're going to be a corrupt cop or whether you're going to try and change that image. AT: But if you're not interested in that you can also play an oblivious person - just like in real life - who doesn't care or get involved in the politics. Back before we got rid of the magic and swords, they shifted into different nations and political ideologies. That's sort-of come across here too. HH: Yeah, because you're actually playing in a fully fleshed out world that we have mapped out. AT: Initially we wanted to make a game that's about forty times larger than this, but seeing how much time and effort this has taken us, I now understand it was a crazy idea. But we've been building this world for the last 16 years so it's quite massive. OW: How long would a typical playthrough be? AT: We're estimating around 30-35 hours or so. HH: Something like that, yeah. But we also think it's definitely something that's meant to be replayed. I know a lot of RPGs aim to do that, but I think because there are so many secret quests and so many different ways to build your character, it'll take a while. I mean, we have 24 skills, so it's definitely meant to be replayed. AT: I could go through the game at least three or four times without repeating myself. I think I could do four distinct ways so I could still be surprised about things. I wish I could have played more of the game but after 45 minutes had passed, I was told I hadn't even scratched the surface of what was being shown at EGX. One person had even stayed on the machine for several hours. It felt like there was a huge chunk of stuff to do in such a short amount of time, and with up to forty hours of gameplay on a single playthrough, it feels like this could be a game that many will play for hundreds. What Tuulik and Hindpere said about the political atmosphere of the story intrigues me a lot. In 2018, a time where police corruption and brutality is a frightening reality for many, it will be interesting to see how Disco Elysium takes both a political and apolitical approach to this topic. Personally, I don't think it will be able to remain apolitical on this subject, as the entire game seems built around letting the player decide if they want to be a good cop or a corrupt one. I can't see there being any way around that. 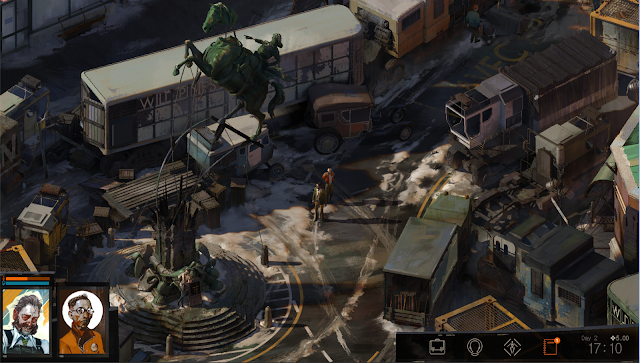 As far as indie games go, Disco Elysium was probably the main one a lot of people were raving about at EGX. It is being published by Humble Bundle, a site known mainly for its charity bundles and indie-focused storefront. It has since also moved into publishing and found its feet by releasing hit games such as Staxel and Cultist Simulator. 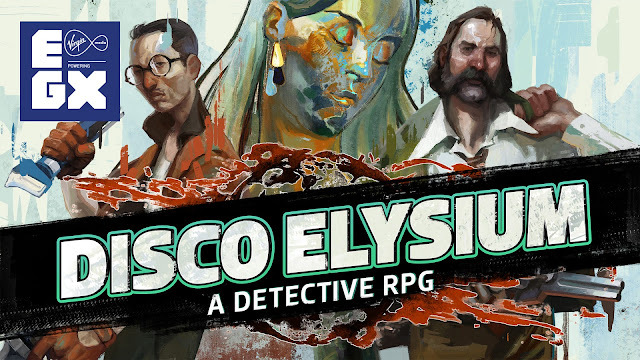 For fans of old-school isometric RPGs, make sure you add Disco Elysium to your watchlists. The release date is still unannounced, but the game is looking very polished and it may not be far off.